In recent years there has been a definite increase in consumers interested in what’s in their cosmetics products. 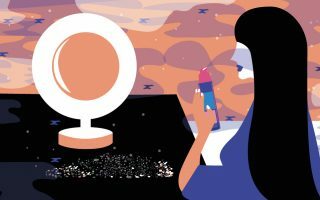 With a highlight on health, wellness, and green beauty, it’s not uncommon for people to take a long hard look at the labels of some of their most favorite products and get a deeper understanding of what exactly those ingredients do. One of the most common and controversial ingredients of late are silicones in cosmetics. The two that show up the most are cyclopentasiloxane and dimethicone, and these silicones are used in abundance across the cosmetics space. So why the controversy? While cyclopentasiloxane and dimethicone silicones in cosmetics are considered safe for the skin, there’s some debate on whether or not they’re actually helping or simply masking the most common skin conditions. Opinions on silicones in cosmetics vary from person to person, but in order to make a decision, you have to understand exactly what silicones are and how they work in your favorite cosmetics. Silicones, at their most basic level, are a slippery substance that is derived from silica. It is characterized by its fluid property and slippery texture, but also it is known for its emollient and water-binding properties. Silicones in cosmetics have been proven to help with a wide range of skin condition and concerns. They are particularly helpful in soothing and healing capacities which enables them to be used across products in the cosmetics space. There are countless different types of silicones in cosmetics but the most common are cyclopentasiloxane and dimethicone. These two silicones are found most commonly in hair care, creams, and other skin care products. With all of the benefits that silicones in cosmetics provide, it’s interesting to note that there are so many who believe that using silicones like cyclopentasiloxane and dimethicone can actually worsen many skin conditions. Some of these claims include that silicones clog pores, can cause acne, lead to dull and dehydrated skin, and even affect the skin cells natural regeneration process. 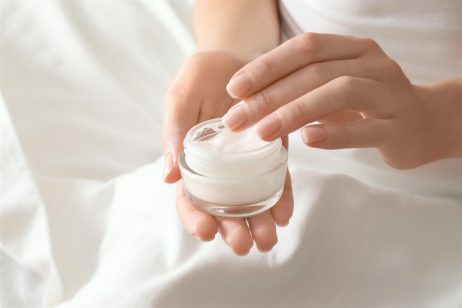 In essence, silicones in cosmetics have been claimed to actually suffocate the skin rather than provide the benefits. While these claims are understandable, and in some cases seem to make sense, it should be noted that all the silicones in cosmetics have been approved and deemed safe for people to use. To get a deeper understanding of how silicones in cosmetics work, let’s take a closer look at two of the most common. Starting with cyclopentasiloxane. Cyclopentasiloxane is commonly found in hair products. Cyclopentasiloxane for hair is used for its conditioning and lubricating properties. Think about your favorite conditioner and how once applied, it gives the silky slip to hair. In many hair moisturizers, cyclopentasiloxane is able to give off a damp or wet appearance which helps the hair look healthy and hydrated. Although cyclopentasiloxane hair benefits are most prominent, the same conditioning and lubricating benefits work inside skin care products as well. You’ll find cyclopentasiloxane in facial moisturizers, anti-aging serums, and even sunscreen. Like all silicones in cosmetics, cyclopentasiloxane has been evaluated for safety. Cyclopentasiloxane safety has been approved for consumer use, however, there are a few things to note. Some research has shown that cyclopentasiloxane can cause mild irritation and there are some concerns related to the effect of cyclopentasiloxane on the environment. For this reason, many people who are eco-conscious prefer not to use cosmetics that contain cyclopentasiloxane. The other popular silicone that is commonly used in cosmetics is dimethicone. Dimethicone in cosmetics is used as a skin protectant and anti-foaming additive. It also works very well in helping the skin retain moisture. Dimethicone is known for that same slippery skin feel that cyclopentasiloxane is known for, but mainly it’s distributed for skin care uses. Dimethicone in cosmetics is used for creams and serums to help smooth the skin and give it a hydrated appearance. While you can find dimethicone in cosmetics across categories, there are two main places where dimethicone shows up the most and they may surprise you. Dimethicone cream is extremely popular in intense moisturizers for its ability treat dry skin. It’s not unusual for a dimethicone cream to be used to treat skin conditions like dermatitis where the skin is chronically dry, patchy, and itchy. And because it’s also known for its ability to reduce inflammation, dimethicone creams are also used to treat conditions like rosacea. The other dimethicone use is to treat lice. Known for being notoriously hard to treat, dimethicone has become somewhat of a breakthrough option in lice treatment. With lice, simply washing the hair will not work because lice are able to survive in water. They are not, however, able to survive in dimethicone. Using dimethicone for lice works by suffocating them, effectively getting rid of them quickly and easily. Like cyclopentasiloxane, dimethicone has been evaluated extensively and dimethicone safety has been approved for use in cosmetics. In cosmetics, dimethicone is probably one of the most valued silicones of them all. Although the research surrounding silicones in cosmetics is extensive, there are people who’d rather not take the risk of clogging their pores or possibly negatively impacting the environment. For companies catering to these consumers, they may turn to dimethicone and cyclopentasiloxane alternatives. Natural based silicone alternatives are a popular option with vegetable glycerin being one of the first that brands try. Some limitations with a natural based silicone alternative are cost and performance during the formulation process. There are some synthetic silicone alternatives available that companies may choose to try in an effort to decrease the number of silicones inside their products that provide the same benefits of the silicones without some of the worries. And in the middle are silicone alternatives that are synthetically made to mimic natural alternative that hope to provide cosmetics with the best of both worlds.